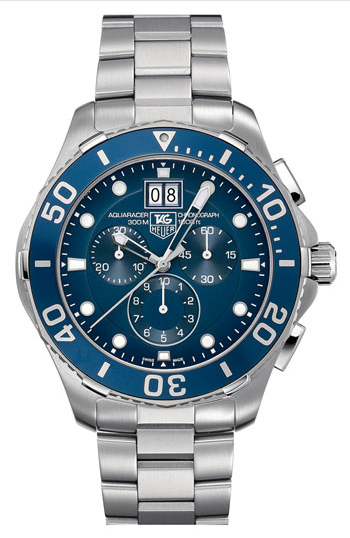 This gorgeous timepiece from Tag Heuer is designed especially for deep undersea diving and the most dedicated athletes. It was designed for professional divers by professional divers, and has been tested rigorously for the ultimate underwater resistance and accuracy. The chronographs measure time to the nearest 1/10th of a second for an extremely accurate reading. When diving, you will have a particular amount of oxygen that will run out after a set amount of time. Therefore, accurate timing is pertinent for a safe and fun diving experience. As there are three chronographs, simple time measurements and additional time measurements are both possible. They also measure up to 12 hours of elapsed time. The unidirectional turning bezel acts as a safety feature on the timepiece. You will be able to chart exactly how long you have spent diving using your bezel by turning it to the right if necessary. Once you have turned the bezel, you cannot turn it back unless it is wound back to its original position by turning to the right. This means that the indicated amount of time you have remaining will never increase and will only decrease if the bezel is accidentally turned. It also has six large studs surrounding the bezel so it can be easily adjusted underwater even when wearing diving gloves. The oversize screw in crown with double gaskets are specially designed for extensive underwater use. They are easy to hold and can be handled while wearing diving gloves. Watches without a screw in crown are not highly recommended for underwater wear. In addition to these accommodations, the dial is legible in the dark and underwater. The hands and hour markers are white with silver lining and illuminate in the dark. The time is easy to read against the blue background of the dial and has hour, minute, second and split second hands. There is also a “Grande Date” display beneath the 12 o’clock marker. The bracelet has a double security clasp so your watch will not leave your wrist accidentally. Overall, this is an incredibly accurate and immaculately designed timepiece suitable for the very best divers!